Durable, warm down parka with anorak design for people who spend a lot of time outdoors in the extreme cold. G-1000 reinforcements in the front, on the sleeves and across the rear make it a robust, hardwearing working garment. The mid-length opening has a zipper and a lined gusset, a construction that has few weaknesses and offers maximum heat for the upper body. It is made from a supple, durable polyamide and is padded with down of the highest quality. 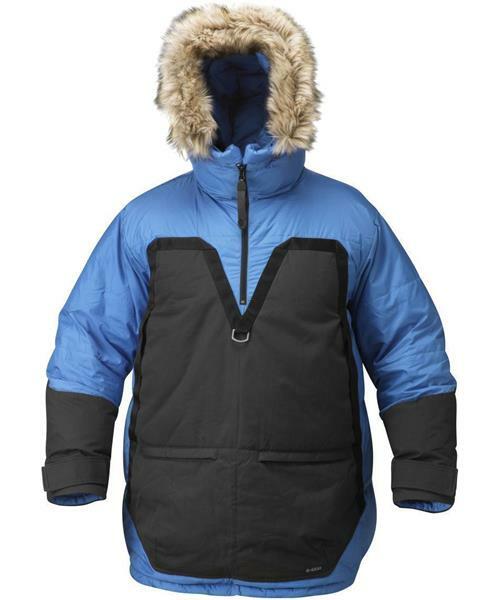 The fixed hood is adjustable and has detachable synthetic fur edging that provides protection from the snow. Reflective stripes on the hood and in the back for extra durability during dark winter months. The G-1000 section has a large, fleece-lined kangaroo pouch that can easily hold an extra pair of gloves or other bulky items. There are also two vertical and two horizontal pockets for a compass, tools and other small items. A D-ring in the middle of the chest offers a fastening point in rough weather. The parka has a drawcord adjustment at the hem and sturdy velcro sleeve cuffs. Thanks to its generous width, it is easy to pull over regular shell garments.